We have found we need to be careful when recommending the IQAir Healthpro Plus air purifier to potential customers to make sure we ask them why they want the V-5 gas filter cartridge and how they plan to use it. If a customer has light gas and odor issues, the IQAir HealthPro Plus will be the correct choice. However, if the customer plans to use it for smoke during home renovations, the IQAir GC Multigas air cleaner would be necessary. The reason for our recommendation is the Hepa filter in the GC series is located after the V-5 gas filter cartridge and it will adsorb some of the odors, even those that will now come from the hepa filter. The paper material in the Hepa filter is porous in nature and will adsorb gases and odors similar to the way your clothes do. 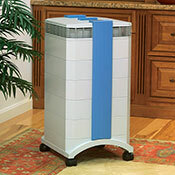 Therefore the post hepa filter design in the IQAir GC series handles that problem. We do not recommend the HealthPro Plus for smoking odor control because the machine will give off odors if moved from place to place – just as your bar room clothes will emit odors. Again the IQAir GC Multigas is the air purifier of choice for smoke odor control. If a customer wants to use to use their air cleaner to remove continuous or large amounts of gases and odors, we recommend the IQAIR GC Multigas unit even though it is more expensive. At the risk of being repetitive, in the Multigas units, the Hepa filter is located at the bottom of the unit and the gas filters after it, which will also result in any outgassing from the Hepa filter to be removed by the gas filter cartridges. In addition, the IQAir GC Multigas has four large gas filter cartridges with a very large surface area, and more than twice as much filter media than the V-5 gas filter cartridge on the IQAir Healthpro Plus. Furthermore, customers plan on doing any renovation to a particular part of their house like painting, refinishing a floor, etc. they would be better off opening the windows and airing out the room for several days. These air cleaners are not designed to be moved from an uncontaminated room to a room where there are renovations going on and then back to the original room with changing the filters.